The IPTC Photo Metadata Standard is the most widely used standard to describe photos, because of its universal acceptance among news agencies, photographers, photo agencies, libraries, museums, and other related industries. It structures and defines metadata properties that allow users to add precise and reliable data about images. In the early 1990s, the original “legacy” IPTC-IIM (Information Interchange Model) schema was developed to organize, systematize and unify the way information was stored and transported with images. Prior to it, every management system had its own way, which did not transfer data between other software and file formats. Today, the IPTC Standard consists of two schemas – IPTC Core and IPTC Extension – which were built on the legacy of the original IPTC-IIM, and developed by the IPTC for professional use with a focus on news and stock photos. IPTC worked alongside Adobe on the technical implementation of the metadata that employs Adobe’s XMP technology as enriched alternative of the IIM format. IPTC Core and IPTC Extension define metadata properties with comprehensive sets of fields that allow users to add precise and reliable data about people, locations, and products shown in an image. It also supports dates, names and identifiers regarding the creation of the photo, and a flexible way to express rights information. If you check this image with some imaging software you should see a value of the field reflecting the name of the field. E.g. as value of the Creator field: “Creator (ref2017.1)”. Property Image Rating. It adopts the “star rating” defined by XMP as part of the IPTC Standard. Property Web Statement of Rights. It adopts the property defined by XMP and labeled “Copyright Info URL” by many software pieces as part of the IPTC Standard. Note: The document is now a web page, was a PDF in the past. Can be printed in a decent layout. Structured property Genre. Extends the semantics of Intellectual Genre of the IPTC Core and allows the use of terms from Controlled Vocabularies. The Registry Entry structure was extended by a Role element to indicate the role of this entry among other Registry Entries. A completly reworked mapping between IPTC Photo Metadata and NewsML-G2 is available now. Structured property Person Shown in the Image with Details. Includes fields for the name, identifiers, characteristics and a description of a person. Structured property Product Shown in the Image. Includes fields for the name, a GTIN identifier and a description of a product. Structured property CV-Term About Image. Includes fields to precisely express a term from a controlled vocabulary, including names in different languages, its identifier and more. Additional properties for the Artwork or Object in the Image structure. More detailed descriptions of the work, contributions to the work, circa dates of creation and style period, as well as rights data. Containers for machine processable Rights Expressions in different languages. One embeds the expression, another one links to an expression as a web resource. 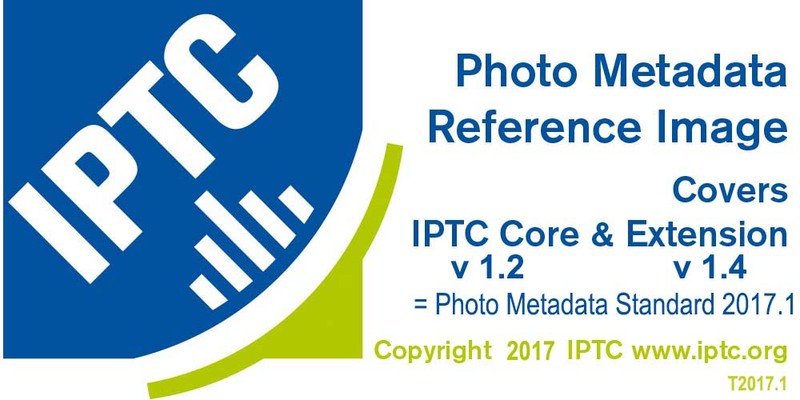 The IPTC Photo Metadata Standard provides a structure for fields as well as descriptions for how fields should be used, and what information should be included. XMP: Developed by Adobe in 2002, and now maintained by ISO. It uses the Resource Description Framework (RDF) data model and XML as serialization syntax. IIM: It uses a genuine data model and binary structures to save the data. How Photo Metadata formats are stored internally of image files are defined by non-IPTC file format standards, such as JPEG/JFIF, TIFF, PNG and more.